Superdry women's Windsprinter tech camo jacket. Technical performance has been combined with sleek design to create this jacket, with reflective detailing to improve visibility in low light and strategically placed mesh detailing to help with ventilation and improve airflow. 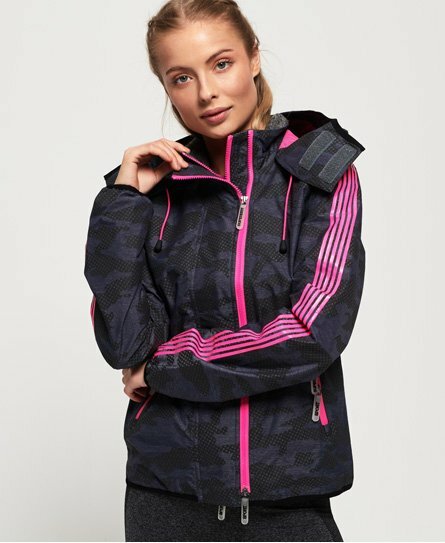 This jacket features a main double zip fastening, bungee cord adjustable hood with mesh detailing, two zip fastened pockets and one inside pocket. Finished with textured striped detailing down the sleeves, rubberised Superdry logo badge on one sleeve and a textured Superdry logo on the back.